The Ropp Agricultural Building is home to the Department of Agriculture, and includes classrooms, several laboratories, and judging arena, and offices. 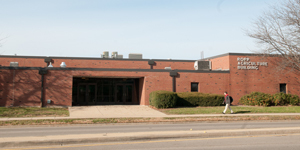 The Ropp Agricultural Building was completed in 1982 and was named for a long-time supporter of agricultural education in Illinois and at Illinois State, Clarence R. Ropp. Mr. Ropp served on the Teachers College Board from 1953–63.